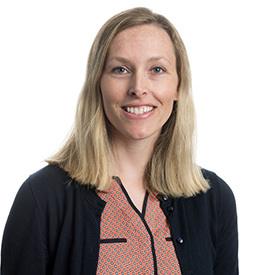 Amber Wolf-Ringwall joined the University of Minnesota Veterinary Medical Center in 2018 as an Assistant Professor of Oncology. A native of North Dakota, she received her DVM and PhD in Biomedical Sciences from Colorado State University. Following her DVM, she completed a small animal medicine and surgery internship at North Carolina State University, and a medical oncology residency at the Flint Animal Cancer Center at Colorado State University. Dr. Wolf-Ringwall has a strong interest in clinical trials, comparative oncology, and making meaningful contributions to translational medicine and the One Health initiative. Dr. Wolf-Ringwall’s research and clinical interests include hematologic malignancies, endocrine-related cancer, elucidating signaling pathways in cancer biology, and comparative oncology. Wolf-Ringwall A, Lopez L, Elmslie R, Fowler B, Lori J, Sfiligoi G, Skope A, Arnold E, Hughes K, Thamm D, EhrhartEJ, Avery A, Lana S. Development of a histopathologic and flow cytometric subclassification system in canine B-cell lymphoma. 2017 ACVIM Forum Proceedings; 2017 June 7-10; National Harbor, MD, USA. Greenwood Village, Colorado: ACVIM; 2017. Halsey CH, Gustafson DL, Rose BJ, Wolf-Ringwall A, Burnett RC, Duval DL, Avery AC, Thamm DH. Development of an in vitro model of acquired resistance to toceranib phosphate (Palladia®) in canine mast cell tumor. BMC Vet Res 2014; 10(105):1-12. Wolf-Ringwall AL, Winter PW, Roess DA, Barisas BG. Luteinizing hormone receptors are confined in mesoscale plasma membrane microdomains throughout recovery from receptor desensitization. Cell Biochem Biophys 2014; 68(3):561-9. Winter PW, Al-Qatati A, Wolf-Ringwall AL, Schoeberl S, Chatterjee PB, Barisas BG, Roess DA, Crans DC. The anti-diabetic bis(maltolato)oxovanadium(iv) decreases lipid order while increasing insulin receptor localization in membrane microdomains. Dalton Trans 2012; 41(21):6419-30. Al-Qatati A, Winter PW, Wolf-Ringwall AL, Chatterjee PB, Van Orden AK, Crans DC, Roess DA, Barisas BG. Insulin receptors and downstream substrates associate with membrane microdomains after treatment with insulin or chromium(III) picolinate. Cell Biochem Biophys 2012; 62(3):441-50. Wolf-Ringwall AL, Winter PW, Liu J, Van Orden AK, Roess DA, Barisas BG. Restricted lateral diffusion of luteinizing hormone receptors in membrane microdomains. J Biol Chem 2011; 286(34): 29818-27.